Chalk-stream fishing in Italy? Yes, you can! Very few anglers know that Italy offers fishing opportunities and sceneries still unknown to most “colleagues” living abroad. 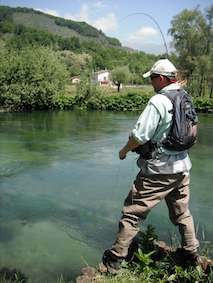 As far as flyfishing is concerned, Italy can be divided into two halves. Have a look at a map of our country: you will notice that roughly below Bologna there is a ideal line of mountains going from West to South-East. Below Bologna, most rivers are quite different both in length, strength, volume and temperature. They are shorter, not so tumbling, with less and warmer water. It is the kingdom of shorter rods and lighter lines, casting precision, delicacy and careful approach. And casting skill, as well: in most cases these rivers are covered with overhanging vegetation and overhead casts are of little or no use. In addition to these two main kinds of water, in Italy we have some regions where rivers flow through a flat landscape, with calm and deep water and a lot of river weeds. While fishing here, the soul goes back to Halford, Skues, Sawyer and their chalk-streams. These areas are located not far from Udine (North-East) and in central Italy, some 1hr’s drive from Rome. I am talking about river Fibreno, originating from a lake (forget about fishing the lake…) and containing a trout living only here and in very few other rivers of the peninsula. It has a greenish appearance and its mouth is softer than Browns or Rainbows. Its name is Trota Macrostigma (Salmo [trutta] macrostigma)and grows to good sizes. It is not an easy fish: it can be extremely selective and spends much of its time hidden by the voluminous water weeds covering the bottom of the river. This river can be stepped into only in some few spots due to the depth of the water; chest waders are of little use. The banks are fully covered with canes (mainly in summer), making casting very difficult. When this trout is active on steady hatches, it may drive anglers crazy. I have seen fishermen slapping the rod to the floor in anger and decide to leave the river in despair. River Fibreno is not far from Sora, where the world known Italian film maker Vittorio de Sica was born, and from Frosinone, the capital of this province. Central Italy is really worth a visit. Don’t miss the opportunity to fill your family’s heart and yours with good remembrances.